Has a Ring Ever Turned Your Finger Green? Home » Science Notes Posts » How Stuff Works » Has a Ring Ever Turned Your Finger Green? Copper in a ring turns finger green. I have been wearing a mood ring and its turned my finger green what should I do?? My boyfriend gave me a ring last night that has 3 gems already fallen off an is too big for my finger. I’ve been wearing it an its turning me green, how do i wear it when its turning me green without hurting him? Talk about a mood green but a finger?? After wearing a moid ring(not sure where i got it) for a day it turned my finger green idk why!!????? So I got a mood rig from claires and after 2 and a half hours I got a green finger and after 2 days of wearing it it don’t get green so yeah. It’s probably nickel, but I’m not sure. It is a cheap mood ring. The surprising thing is that I only wore it for a few hours. I was on Marco Island, sitting in the water at the beach all day, while digging for shells with my hands. The spot was at the edge of the water, so when I would dig down, my hands were under water. Well, I was wearing my wedding band and wedding diamond that day. They are both 14 carat yellow gold. I have had these rings for 9 yrs. at the time and NEVER had any type of discoloration at all. 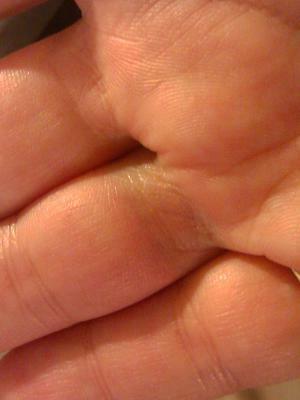 When I came in to take a shower is when I noticed that my finger turned a blackish – grey color. Pretty weird since I’ve worn the rings many times in that same water and never had a discoloration. Maybe it was a reaction from the shells since I basically had small shells in my hands for hours, just scooping away as I sat at the water’s edge in my beach chair, talking up a storm with my mother in law. As far as I know, the only metal that turns my finger green is copper. It’s not toxic. Actually, I think it’s supposed to be therapeutic for some conditions. However, it is not attractive. It has to wear off rather than wash off. ← Do Contact Lenses Glow Under Black Light?